Bernard Cornwell has an amazing talent to pull you back into the smell and sweats, passions and hatreds, of long-gone eras, whether the Napoleonic wars, the high Middle Ages, or the late Dark Ages in this book, part of King Alfred saga. As a woman, I flinch from the violence but he really puts you there on the battlefield. Goodness knows, I've never been close to a modern battlefield, but I'm sure this is how it must've been. I'm all for "peace," but we're never going to reach it if we go on pretending that man is an inherently placid primate and it's only evil capitalists or kings who make them fight. Men, or at least a large percentage of them, glory in combat. That trait is an essential component of all of Mr. Cornwell's novels. Of course, the novel is pure fiction and he makes no pretense to historical accuracy in who did what to whom, but he evokes this chaotic period in England's history to where they were becoming an Anglo-Saxon country. Recently, The New York Times had a long editorial excoriating President Bush over the treatment of al-Qaeda and Taliban prisoners in the Guantanamo Bay detention facility. If you didn't read this particular piece, odds are you've seen something similar: calls to close Guantanamo, end the military tribunals, provide free legal counsel for detainees, and so on. Basically, it's a call to apply a set of rules to detainees --- the rules of the Geneva Convention and the Constitutional rules regarding the right to counsel and the right against self-incrimination. No matter which rules you think are appropriate, nearly everyone agrees that there must be certain regulations that govern how prisoners are treated. In the ninth-century world of Bernard Cornwell's LORDS OF THE NORTH, this is how it works. You have a ring of people carrying branches from a hazel tree, which provide the same function as ropes in a boxing ring. You take your prisoner, give him a sword and match him up against the best fighter from the victorious side. And only one of the two men is coming out of the ring alive. Those are the rules. Actually, it's a good deal --- because the alternatives include hanging and roasting to death. If you're a Viking captured in battle, there are worse ways to lose your life than with a sword in your hand --- at least that way you get to feast in the mead-halls of Valhalla instead of spending eternity at what Cornwell calls the "corpse-hall," which sounds much less fun than even Guantanamo. Uhtred's glory-road leads to the northeast corner of England, where he hopes to face old enemies Kjartan the Cruel and Sven the One-Eyed. His long-term goal is to regain the fortress of Bebbanburg, where his father once ruled, but revenge is also on his mind. He finds his enemies without too much trouble, but accidentally manages to liberate a slave named Guthred, who turns out to be the rightful king of Northumbria. With the fervent backing of the Church, Guthred takes command, raises an army under the banner of Saint Cuthbert, and sets himself against the Danish warlords who threaten the peace. LORDS OF THE NORTH is striking in that it manages to display even more ruthlessness and treachery than the previous entries in the series, not to mention one stunning, unexpected plot twist. But Uhtred is up to the task; he returns to the North to settle accounts and take his long-delayed revenge at last, in the shield-wall. Cornwell's masterful touch in describing wars and warriors has not deserted him here, and the final battle is as satisfying as it is barbaric and bloody. Uhtred's tale is grim, blood-soaked and defiantly politically incorrect, but it is also rousing, stirring and even philosophical at times. Fate, we're reminded over and over again, is inexorable. Should yours draw you to the shield-wall of the Vikings, you'll have no better guide than Bernard Cornwell. After reading some of the reviews here for "Lords of the North", I was a bit worried about what I would find. Being the third book in the series, I wondered if Cornwell could keep it going for a third book. It would have been understandable if things slipped a bit. I needn't have worried. Following from The Pale Horseman: A Novel from the year 878, "Lords of the North" sees our hero Uhtred head north to follow his fate. Of course, the Three Spinners have other plans and Uhtred soon finds himself enslaved and alone. I won't mention too much of the plot, as I do not want to ruin it for you. There are some good twists and turns, and I was rather surprised sometimes. Elements and people I had forgotten about made sudden reappearances, much to my own pleasure, I might add. In this volume, Alfred the Great is developed a bit more, as is the relationship between him and Uhtred. Always a tense one, that relationship moves to a new level as Uhtred develops a more complex picture of the King he hates, yet serves. The violence seems to be stepped up a couple of degrees in this violence, and at times, I have to admit relishing it. Some very deserving people got to taste Serpent-Breath's edge as Uhtred took his revenge on them. At times, the descriptions get pretty detailed, with mentions of "gristle" thrown in, just in case the reader does really get it with the "blood" gushing everywhere and coating the hilts of swords and mail. Cornwell has kept up the pace in this book, with a seething tale of revenge and some excellent twists that kept me rivetted to the pages. This book kept me hooked to much greater degree than the last two volumes, and the turns in the plot were a big factor in that. The developing characters were also a large factor, especially those of Uhtred and Alfred the Great. I still have some puzzlement with regard to Uhtred and his deeper motivations. This is a great volume that keeps the pace and keeps the plot moving. It is a fantastic read and I can only hope that Cornwell hurries to get number 4 out. In his long string of historical novels, set in various eras, Cornwell really delivers his best in this series set in the time of King Alfred the Great, along with his earlier trilogy about Arthur's time (The Winter King, Enemy of God, & Excalibur). Characters, major to minor, are well-drawn; historical detail is rendered with minimal anachronism; and the plot and action are gripping. This is a historical fiction set in the times when the Danes were settling in the British territories of the Anglo-Saxons. The story takes place in the reign of King Alfred of Wessex. This is actually the third in a series, but it reads well as an independent story. I had not seen the series and just came across this volume in a bookstore while living in Edenvale, South Africa in 2007. I was not familiar with Bernard Cornwell, and was pleased with the authentic flavour and style of his writing and character development. He comments in the story on the differences in the Germanic dialects of the Danish Vikings and the Anglo-Saxons. The author reflects extensive historical research and projects a realism in the use of word-forms and names of places and people of that era. In book one, Uhtred serves a Christian king for little reward. In book two Uhtred serves the same king (Alfred) for no reward. In book 3, well, I think you can guess, he serves a different king, rescues him from slavery as a matter of fact, and again there is no reward. The fact that Uhtred is constantly unrewarded for his service is one of the main ways of generating sympathy for him, but I had to draw the line here. Again in this book we have the same theme of uniting power of Christianity and yet the ever corrupt church officials and its denials of life's pleasures ruining the day for Uhtred. This would be entertaining except this horse has already been beaten to death in books 1 and 2. I can only muster so much indignation at the monks and priests that Cornwell trots out before I give up on the book. The last, most recent reviewer wrote that he suspected the author had a deadline to meet. Bingo! This time he ventures geographically and chronologically into misty venues. I think the book suffers for it. It drifts around, the characters are vague and less well sketched...the action scenes almost by rote....or Word cut-and-paste. I bought the book at Heathrow, before a 10 hour flight back to SFO on an empty plane. I could barely focus, with no other distractions. I hope it the cause for the let down was an early deadline. And, lord knows, Mr. Cornwell has delivered twenty or thirty winners in a row and deserves my gratitude. Again, Cornwell walks the perfect line of historical fiction here. Too many authors get bogged down one way or the other, they are too interested in the historical accuracy, movement of troops, description of weapons, etc - that they abandon story and narrative voice. Other writers don't ground themselves enough in this world - and you end up with another book in the "fantasy/science fiction" pile. What I love about Cornwell, is that his books, give you some history to root the book, but the thrust of the book is a a strong narrative, an emersing feel to the time period, and a strong bond to the characters (most of which are fictional). First, let me say that I've read alot of Cornwell's works including the entire Sharpe series and the other books that preceded Lords of the North. I'm a big fan of his and thinks he does outstanding work especially with military history. Bottom line I was disappointed in this one. There were too many things that 'just happened to happen'. And the ending was a big letdown as well. Perhaps my expectations have become so high that when he writes something that, I think, is not up to his high standards its a big disappointment. In spite of that I eagerly await the next installment in this series and will buy it the first day its available! I enjoyed reading this book after waiting for its release for some time. Bernard Cornwell grips the reader early on and deftly weaves his plot capped by a satisfying conclusion. Along the way you just might pick up a little history. Bernard Cornwell must be part machine - there's no way that a mere mortal can continue to crank out so many novels and have them be so darn good. While it's true that Cornwell recycles a bit of material now and then (I think he's got a macro on his PC that contains the paragraph showing how to load a Baker rifle, since that passage shows up in virtually every Sharpe novel), a review of his works shows a staggering scope. And his books rarely seem tired. 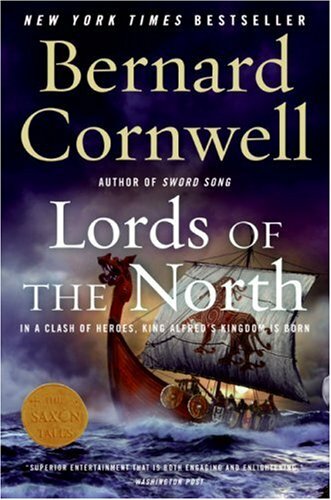 "Lords of the North" may not go into the pantheon of Cornwell's best novels, but there is plenty of the hallmark Cornwell style at play here. This is a savage, pell-mell novel that has plenty of history and humor for the careful reader. Lord Uthred is now 21 years old, in the full flower of his strength and fighting prowess. He has a hoard of silver in his bag, his swords in his belt, and his woman, Hild, on his arm, and yet Uthred is enraged at the outset of the novel. Why? Because he helped King Alfred win his kingdom in the last novel ("The Pale Horseman") and yet Alfred gave him a paltry award. For a Saxon raised by the Danes to believe in honor and the spoils of victory, this is a massive slight. And so it is with rage in his heart that Uthred returns to the north, the land of his youth. What ensues is a tale of revenge and treachery as Uthred confronts the men and women who played such a key role in his younger years. I'll try to write a spoiler-free review here, so that's as much as I will say about the plot. But Cornwell is up to his usual tricks here, so be surprised at twists and turns in Uthred's road, but trust Uthred to solve his problems with a sword and more than a bit of cunning. Cornwell also gets to poke fun at the early Christians who ran around Britain, just as he did with his King Arthur series. The Danish perspective on Christian rites and devotions is hilarious, and Cornwell has clearly done his research into the early years of the church. This is the third and latest instalment of the tale of Uhtred and, in my view, is even better than the previous two. By now, those who've been following the story will know of Uhtred's history, his divided loyalties and his determation to try to recover his family lands. Cornwell has so gradually built up the picture of conflict and introduced characters through the last two books that reading this novel is like rejoining old acquaintances. Uhtred remains constant in his objectives and despite betrayal will continue to ally with whomever is most likely to take him towards his goals. Set in the 9th century, the battles - between the mighty Danes and the Kingdom of Wessex continue, as do the lesser battles between the apparent allies on both sides. As in the previous two books, Cornwell makes these battles come alive. There is plenty of action, intrigue and mayhem. Be warned: this is not a book for the squeamish. The battle scenes are integral to the plot and I suspect it would be difficult to follow the story without reading them. Lords of the North is the third volume of Bernard Cornwell's "Saxon Tales", set in ninth-century England, and is every bit as enjoyable as the preceding books in the series. In this entry, Uhtred goes north to settle a long-standing bloodfeud. With his customary flair for the dramatic, he disguises himself as the Dead Swordsman and heads toward Dunholm, the fortress of his enemy, Kjartan the Cruel. Along the way he frees a slave who turns out to be Guthred, king of Northumbria. Uhtred swears loyalty to Guthred and soon learns that, despite his congenial manner, Guthred will do whatever is necessary to preserve his kingdom. While Lords of the North does not deal with any significant historical event, it does have political intrigue, betrayal and lots of swordplay. As always, Cornwell's battle scenes are visceral. Having been bitten by a dog as a child, I found his descriptions of attacking dogs particularly unsettling. The book's main strength is Uhtred, an extremely likable and unexpectedly complex character. Born English, but raised by Danes, he is continually torn between his adopted people and his oath, given unwillingly, to King Alfred. Irreverent and insightful, Uhtred tells his story in the first person, describing moments of brutish violence and tender emotion with a slightly sardonic flair. I really enjoyed this book, and I look forward to the next installment in the series. Thank you, Mr. Cornwell, for helping me release my inner Valkyrie! In Lords of the North (coming January 23rd), the wonderful writer of great historical periods and characters brings us the third in his increasingly popular Saxon Chronicles series, as he tells the story of King Alfred the Great's life and his work in unifying the many kingdoms into the country we know today as England. We continue with our hero, Uhtred of Bebbanburg, who has just helped Alfred save and maintain control over the land of Wessex, therefore preventing the complete invasion by the Danes. Angered with Alfred's piousness and making every decision according to God, Uhtred flees north to Northumbria, still hoping one day to defeat his uncle and take back his beloved Bebbanburg. It is here that he meets old Danish friends and before he realizes what's going on, a deal has been brokered to maintain peace in Northumbria in return for Uhtred's enslavement. With his blood-stained blade - Serpent-Breath - the many lords of the region are happy to get rid of this formidable warrior. Uhtred, stripped of his title and power, then spends most of the book suffering the abuse and torture of a slave on a trading traveling along the Flemish coast, and back and forth between Britain and the mainland. On a number of occasions they face off again this "red ship" that is a trader like them. Upon returning to the original place where Uhtred was sold - so that more slaves can be bought - the red ship appears out of nowhere and beaches the shore. Foreign Danes stream out and Uhtred soon finds himself face to face with an even older friend who raised him. Eventually he discovers that it is thanks to Alfred's help that he has received his emancipation. With his title, weapons, and armor restored, along with more allies from the south forming a considerable army, they set out to defeat these lesser heathen lords and regain control of the kingdom of Northumbria. The book ends with the reader contemplating what is next for Uhtred in the further Saxon Chronicles: Will he regain control of his land? Will he remain a lone pagan among the many determined Christians? Sadly, we will have to wait another whole year before we can read more about Uhtred of Bebbanburg, slayer of the great Ubba Lothbrokson, and his adventures with the pious Alfred the Great. "I AM UHTRED!" The most compelling character ever created! I am in LOVE with Uhtred! He's the ultimate realist, the ultimate warrior, the ultimate Alpha Male, the ultimate loyal friend, and the ultimate hero. He's a devastating blend of Hamlet, Errol Flynn (as Captain Blood), and Aragorn, but smarter, more perceptive, and more resourceful than all of them put together. He also has more heart than any protagonist I've ever encountered. I am in love with Uhtred, and I'm in love with this series of books, every single one. I can't compare them because, to me, they are one long story with perfect continuity and a logical progression of characters and events, not three separate books. The third book in Bernard Cornwell's Saxon Chronicles, Lords of the North picks up just after the end of book two, The Pale Horseman. We are following Uhtred, our hero, as he moves north in the kingdom and away from King Alfred. Uhtred fortuitously frees a slave named Guthred along the way, only to unwittingly help Guthred become King of Northumbia. Uhtred, looking to mend his broken heart over the death of Iseult, quickly finds himself in love with Guthred's sister Gisela, and fighting to help the likeable Guthred keep his kingdom. What follows next is a betrayal of the first order, and oaths that must be remade despite promises to never give one again. Uhtred is a hero that is larger than life: a superb swordsman, a brilliant war maker, a randy lover, and someone you can never count out. Still looking to regain his lost inheritance, Uhtred manages to find plenty of excitement along his journeys, joining forces with his best friend Ragnar to support those most in need and seemingly coming out on top most of the time. NOOOO!!!!! 6 months wait for the next book. This was GREAT! Book three in the Saxon Chronicles is the best book by Bernard Cornwell that I have read. I had read his "Grail Quest Trilogy" before coming to this series, which I thought was a trilogy, but now know could go on much longer (it will be at least 4 books and I certainly hope for more). "Lords of the North" continues the fantastic, emotional tale of Uhtred, the fictional Saxon-born, Dane-adopted and raised warrior, that is fated to fight for England and a king that he does not like, Alfred. Uhtred lost his family when he was a boy and was adopted by a Danish Viking warrior, Earl Ragnar, who he loved as a father, and from whom he learned of the pagan deities, especially the spinners, the three mythical creatures that weave the fate of every man; hence his repeated statement through the entire series, "Fate is inexorable". Uhtred, after assisting Alfred the Great with the defense of Wessex against the Danes, marches north to regain his birthright which was taken by his uncle when Uhtred's birth father died in battle. But fate has other plans for Uhtred, including assisting another king, killing priests, killing Saxons, killing Danes, loving a woman who becomes a nun, loving another woman who is betrothed to another, betrayal, slavery and revenge. Not bad for six months in the life of a Saxon/Danish warrior in the ninth century. The author admits in his historical note at the end of the book that this tale is more fiction than fact, mainly because not much is known about the history of the Northumbria, the northern Saxon province. Using the name of the king, Guthred, and the characters he created in books 1 & 2,(which I highly recommend you read before coming to this; not because you need to in order to understand this book, but because the entire series is fabulous and why skip the salad and appetizer to get to the main course when the entire meal should be savored?) to weave a more fictional tale that is still most definitely anchored in fact, so far as the customs, trials, dangers, life, religions and battles would have been in the ninth century; that is to say that, despite the fact that none of the characters are real (except Guthred of whom not much is known) the entire story is told in accordance with the period and should be taken as an authentic description of fictional people. The world which Cornwell writes is wonderful, historically accurate and vivid.